The golf ball catch was captured on film and released on YouTube, http://www.youtube.com/mercedesbenzuk. The SLS AMG Roadster landed the record of ‘farthest golf shot to be caught in a moving car, ever’. 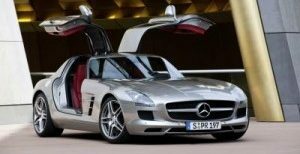 Professional golfer Jake Shepherd hit a golf ball at 178mph into the Mercedes-Benz supercar, which was moving at a rate of 120mph when it caught the ball 275 meters away from the tee.